Description: How to draw realistic drawings from photographs. Concepts covered include cropping photos, editing photos, creating a grid, drawing with the aid of the the grid. I like the integration of digital technology and fine art in your classes. I am sure I am going to be learning something new. Thank you. Fantastic!! I now know why griding is preferable to tracing. photo which is very clear and highly detailed. The problem might be my printer’s capacity to print. trying to emulate the same style while drawing the fur: not quite the same….will need to look deeper in the technique. Grid is a future technique for me! I really loved watching this sketch come alive. Awesome!! I also loved seeing your sketch come alive. Thanks for adding. The grid technique is something new to me. It seems like something that does take patience but is very rewarding as well. Looks like I will have to try this! What is the catch to getting the grid to print on the image? All the image and grid adjustments worked well, but cannot get the grid to print. Using OSX 10.6.8 and Adobe Photoshop Elements 4.0 (2008); same difficulty with GIMP. Thank you. Liked it too. Seems possible to draw from photos. Great instruction!Your observation on patience (which I’m not good at but working on)is valuable to me.Thanks for the excellent teaching. I spent 3 years in art school and I have learned so much in these few days of watching your videos. In school, my professors focused on the idea of conceptual art and creating a series of art based on an enduring idea. Often times this seems to create a block for me because I have no idea where to start and its overwhelming. I wanted to ask if you used this enduring idea and how you approach it if you do? Any advice would be much appreciated. Thanks for your comments. I’m not familiar with an “enduring idea”, but it sounds a lot like a theme. My opinion is that art doesn’t have to fit into a category. In other words, requiring you to have an “enduring idea” doesn’t make a lot of sense to me. I think that you should just keep creating and let your voice and message emerge on its own time. you teach about how i could use photoshop and make those 3×3 box easily. thank you. i use macbook. there is no photoshop. (I miss the Microsoft computer now). For these simple line work. what kind of free apps would be helpful? Or, instead i should purchase some kind of specific app? ah…. by the way, what kind of affordable or free beginner artwork apps you think is great? Oh I find out your suggestion in the ‘resource’ area. sorry that i focus in the ebook at the beginning. thank you. Photoshop is definitely available for the Mac, there’s no question about that, it’s always been available on the Mac since the very first version. However, unless you’re going to get into extensive commercial image production either through digital art or photography, it’s much more than you need especially given that is not free. On a Mac, you can download the GIMP (Gnu Image Manipulation Program) to get a lot of the same features and not pay for it. If you want a commercial option, then the rather fantastic Affinity Photo application (available in the Mac App Store) is a great choice and one that I would recommend to Photographers looking to break free of the Adobe world. Failing all of that… Many word processors can get you there too. For a Mac, using Pages (which is free from Apple), you can drop in the image on a blank document and adjust the size. Then using the editing tools, move the saturation slider to -100% to make it grayscale. Finally use the ruler and guidelines to draw your grid with the line tool. Hi, Matt, This is Ophelia from China. Thanks for the video. I am just wondering about the technique you use for the background there. You say you use small circles? The effect is nice and neat but we dont really see the small circles. no direct lines or cross hatching there？ Do you use cirlcles instead of direct lines so as to vary from the fur texture(lines)? You may not see the actual lines that are created by drawing small circles. It’s really more about applying the material using a circular motion to eradicate any visible lines. Like Mary Anne, I cannot get the grid to print on the picture I am using. I am using photoshop, and I looked up on their help, and the only thing I could find on grids says that the grid is non printable. Any suggestions? This is just the motivation I needed. I downloaded GIMP and I am drawing my first grid drawing (since majoring in art in college) from one of my husband’s photos. I am so glad I found this website. Thank you! Hi I am really enjoying your videos, so far I haven’t tried to do any drawing but I have downloaded the ebooks and when I start drawing will go through the videos again. Your drawing today was amazing. I have used a grid before so do know the benefits of it. Hi Matt, the next video in this series module 13 “creating successful compositions” does not have the module header bar and the click to view option. I am viewing on my iPad and don’t normally have any problems. I will try shortly on my PCs and see if this happens there too. Everything is normal on this end. You may check and see if your network connection slowed for a moment. It is fine on my pc so it must just be an ipad issue, as it is the same today. Regarding the Photoshop grid….. In Windows, instead of “Photoshop.. Preferences .. Guides, grids, & Slice”, try, “EDIT.. Preferences… guide/grid” to get to the screen where you can make the grid size and color choices. This is great practice. Initially I really procrastinated this. Then I learned the grid in Photoshop. More recently I transferred design to paper. Then I procrastinated. Then I began to do the value work. After an hour, I began to study tutorials on drawing fur. Watched your video many, many times. FINALLY, I began to isolate each address on grid and draw it. I struggled to stay away from spontaneously working other areas but finally I isolated the particular square and covered the rest on both reference & drawing paper. That did not allow me to shift to another area spontaneously because now I couldn’t see it!! Kept thinking “trust the grid” as I worked it, square by square. WOW. That was a very good learning experience. My spontaneity can feel artistically inspired, but I can see that it takes me away from the consistency and deliberate effort that this practice requires to learn value & texture, & form in graphite drawing. I really procrastinated this and now find I learned a lot and am feeling more successful. Great subject for this. Oh my gosh! This is awesome! I first learned to draw using the grid method and always use it for my portrait drawings…but thought it was bad and that if I used the grid then I wasn’t a very good artist and should learn to draw without it. Thank you Matt! You have no idea how elated you have made me with this video. You are such a great artist and I am so glad I found The Virtual Instructor. I am hoping I can pick your mind on something quite crucial. I’ve been able to draw very well since I was a kid – I’m 30. Though I’m an engineer by trade, art remains my first love. I never had formal training, so this course has helped me to grasp the basics of what I need to learn to make my work more realistic. I wish I could post some pics here of what I’ve been able to make use of from what I’ve picked from your lessons – I’m genuinely impressed with myself and hope to learn more. Here’s my question: I struggle drawing using an artificial light, for this reason I prefer working during the day, i.e. when I have time or immediately after work (17h00 – 18h30). I find that artificial light really obscures the quality of the value on paper work – it adds an extra sheen and it tends to become difficult to keep track of gradations in color or shading. I’ve struggled with this since I was kid and rarely drew at night. I rarely draw at night. Is this a common problem with artists dealing with graphite or other mediums? Do I need better lighting in my room and what kind? I’m only asking because it appears you draw next to an artificial light source. Lastly, I appreciate how professional and systematic the content on the site is. 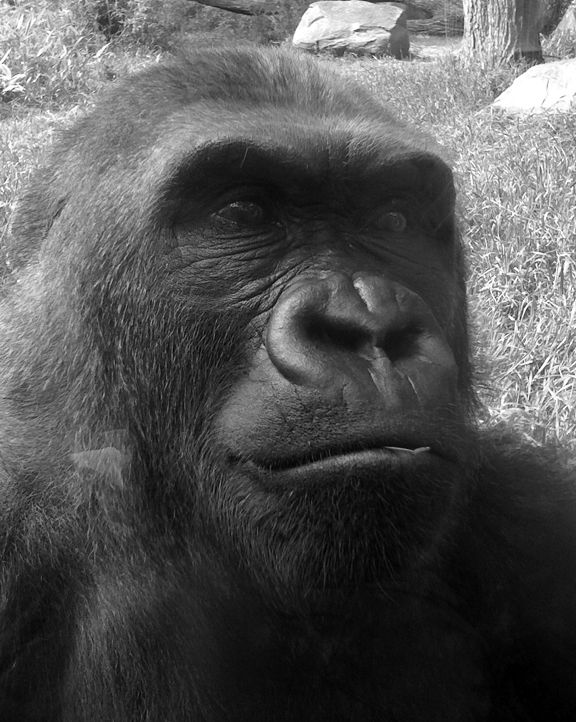 I downloaded your photo of the gorilla but am having difficulty figuring out how to apply the grid using GIMP. Could you please provide instruction on that?